Little electricity for much environmental damage: Defenders of the Schwarze Sulm River protest against the construction of hydroelectric power plants within the protected Natura2000 habitat. During 2006 and 2007, the provincial authorities of Styria, Austria, gave permission to construct two disputed hydroelectricity power plants, located within the protected Natura2000 area “Schwarze and Weiße Sulm” . While the power plants’ expected capacity is rather low (6,7MW ), the related environmental damage would be substantial. 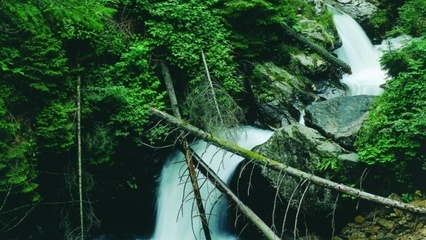 The stations are planned along Austria’s last and longest unspoiled river sections, free of anthropogenic influence [2;3] and characterized by typical natural habitats [4;8] as well as endangered and endemic species . Due to the project’s small production capacity (>10MW), no Environmental Impact Assessment (EIA) was required by the provincial authorities  and a permission to move forward, justified by an “overriding public interest”, was granted to the private project proponents Alfred Liechtenstein, Peter Masser, Karl Weingerl [1;5]. This was the beginning of a still ongoing battle between project supporters - comprised by the regional energy industry - and opponents, comprised by local activists, NGOs and the European Commission. 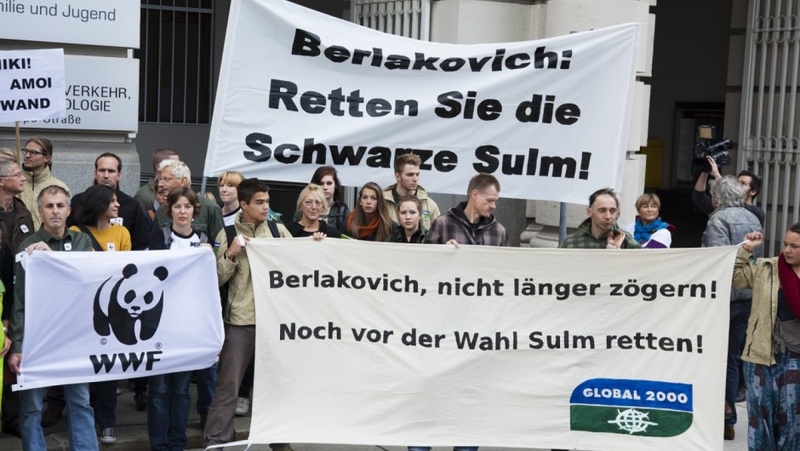 An independent local platform to save the Schwarze Sulm (“Rettet die Schwarze Sulm”)  was established to organize various protest activities, such as petitions, protest marches, concerts and walks along the gorges. Local activists started to set up camps and to guard the area in order to avoid beginning of construction work . In July 2013, some of them were violently attacked by company staff, which further seized their cameras [1;6]. 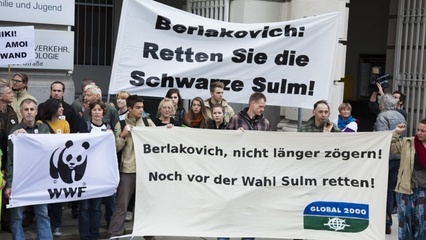 As there was a clear lack of evidence of ”public overriding interest”, objections to the permission were submitted in 2009 by the Austrian ministry of environment; however, due to formal issues, the objections had to be rejected later on by the supreme constitutional court. A series of formal complaints to the European Commission, as well as lawsuits followed, concerning the project’s compliance with the EU Water Framework Directive [1;5;7]. The provincial government agreed to review the authorisation decision, but merely downgraded the official river status to a lower category, in order to make the project possible. 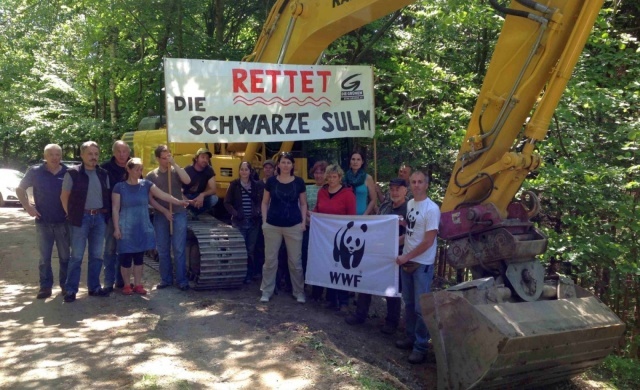 However, on April 16, 2014, the European commission announced that it will take Austria to Court “for its failure to ensure adequate protection for the Schwarze Sulm River in Steiermark” . The final project outcome is yet not clear, but currently likely to be cancelled. However, if the project won’t be stopped, one of the few remaining unspoiled rivers systems in Austria will be destroyed and a precedent will be set for further hydroelectric plants within protected areas. Project Details Project holders are DI Alfred Liechtenstein, Ing. Peter Masser, Ing. Karl Weingerl . The operating company is Sulmkraft GmbH . Technology is provided by the Andritz Group . Investment size is reported to amount to around 20 million Euro . The project is comprised of three small, closely related hydropower stations, one of them further used for drinking water provision. The expected capacities for TKW Seebach (combined drinking water and hydroelectricity station) and KW Schwarze Sulm amount to 800KW and 6.7MW, respectively . The power plants are located within the Natura2000 habitat Nr.3 “Schwarze and Weiße Sulm”, covering an area of 221ha . Development of Alternatives The central aim of the involved EJOs is to stop the project. Video channel, "Rettet die Schwarze Sulm"